Living in a big city with few twigs lying around and not wanting to desecrate the local public parks I used cherry twigs left over from our easter bouquet that I left to dry out on our terrace. 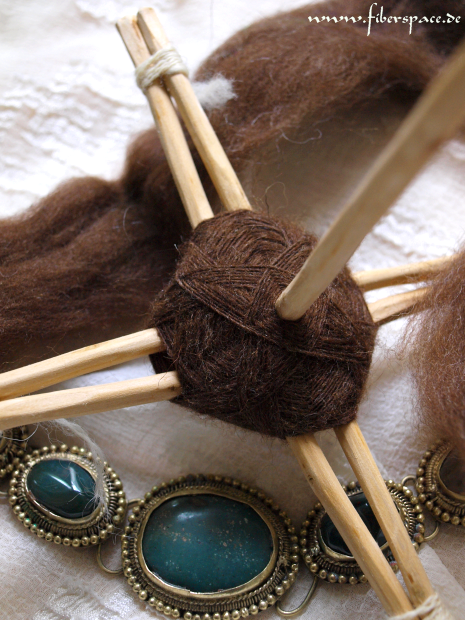 I wrote this tutorial because I spun with my selfmade turkish spindle during the Tour de Fleece and got a lot of questions about how I made this beautiful spindle via private messages. For a tutorial in german language look here. Cherry wood is maybe not the best choice because its relatively light weight. 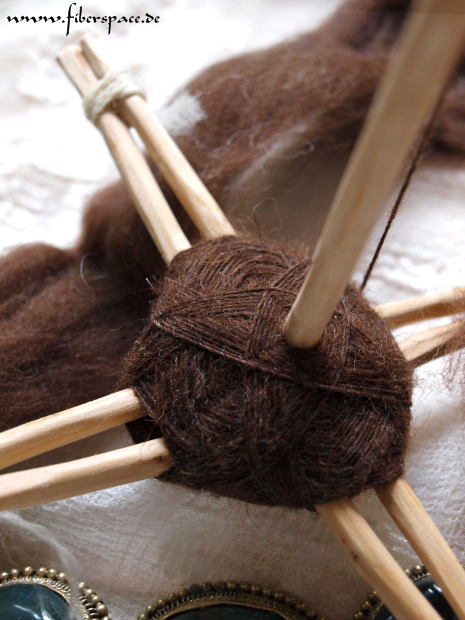 So spinning is a bit annoying at the start but gets better when the turkish spindle gains weight from the spun yarn. If you build one yourself you might use wood a bit heavier. By now I really love it and I admit I’m also a bit proud of it. I like the way it works and I can spin a nice thin and even yarn with it. 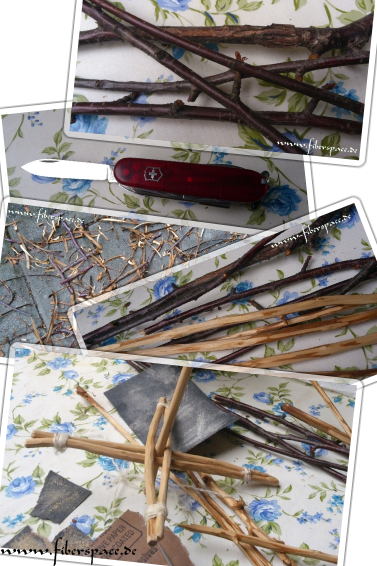 Measure the twigs and cut them to length with the garden shears or saw. Remove the bark and even out the twigs with the knife. Smooth out the twigs with the sand paper especially at the ends. Use the round file to make 2 little notches into the opposite sides of the shaft about 3cm from the lower end. Do the same at 3.5cm from the lower and but shifted by 90°. Those notches help keep the arms of the whorl in place. 2-3cm from the upper end of the shaft you make a deeper notch with the knife and even it out with the file. This notch keeps the loop of yarn safely in place while you spin. Take a pair of whorl arms and tie them together at one end, put the shaft in between and then also tie them together at the other end. Do the same with the second pair of whorl arms. Adjust both pairs to sit crosswise in the little notches at the lower end of the shaft. Done and ready to spin. This is great! I am looking at this on a phone and thought that the cross sticks were take out chop sticks. I might try that with the center piece black anything from my yard. A mix of urban and natural. 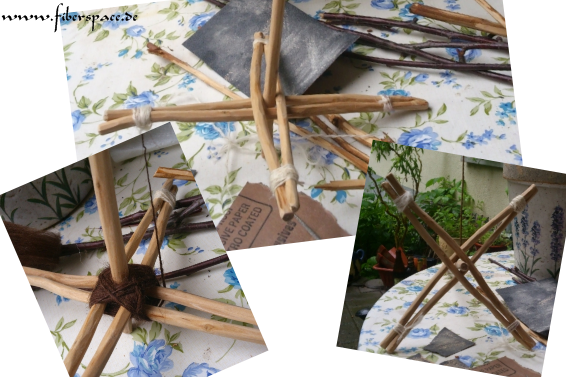 @crowjyne – I wish you a lot of fun with building your own paleo-spindle. Btw. chopsticks are really a nice idea if there are only crooked shafts available. I make one with chopsticks that is similar to yours. It can spin, But I cannot spin correctly and the string cannot wire itself like your. How to spin a Turkish drop spin ? Even after watch tutorial video on you tube, I still cannot. @Laurel – Uhm, yes…? I really know what makes a turkish spindle special. Loose the bindings after you are finished with spinning. After this you shoul be able to extract the twigs with some careful twisting and rocking. How funny. I recently taught two beginning spinning classes. We started out making what one student called ‚MacGyver Turkish spindles‘. We used a dowel, some skinny popsicle sticks and hair ties.